Was just answering a question about my favorite novel for a grad student who’s writing on it, and had to check something in the text, and noticed something a little bit amazing. Here’s an interesting bit by E.P. Thompson on her. And here’s Beatrice Potter (later, Beatrice Webb) on a meeting with her in 1883. Went in the afternoon to British Museum and met Miss Marx in the refreshment rooms. 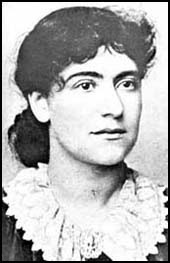 Daughter of Karl Marx, socialist writer and refugee. Gains her livelihood by teaching literature, and writing for socialist newspapers. In person she is comely, dressed in a slovenly picturesque way with curly hair flying about in all directions. Fine eyes full of life and sympathy, otherwise ugly features and expression with complexion showing the signs of an unhealthy excited life, kept up with stimulants and tempered by narcotics. Lives alone, is much connected with Bradlaugh set, evidently peculiar views on love, etc., and I should think has somewhat ‘Natural’ relations with men! Should fear that the chances were against her remaining long within the pale of “respectable” society. Nice! Barnes and Noble gave me a coupon for a free book from their in-house line of “classics” – apparently, I’m an “educator” and they think I could be switched from my beloved Penguins. It’s been sitting in my wallet for months. Finally have something to spend it on. The Marx/Bovary connnection is an interesting one, huh? Emily Apter gave a useful (and brilliantly titled) talk on it at Stanford earlier this year (http://novel.stanford.edu/events_upcoming.htm); I could probably dig up a copy if interested. Well, yes, I’d love to see the Apter talk, if you have a copy.